Richard Meyer and Josh Joffen at the Bottom Line, 1992. Photograph by Teddy Lee. Singer-songwriter and former editor of Fast Folk Musical Magazine, Richard Meyer, 59, passed away on May 14th, 2012 after a long battle with Parkinson’s disease. 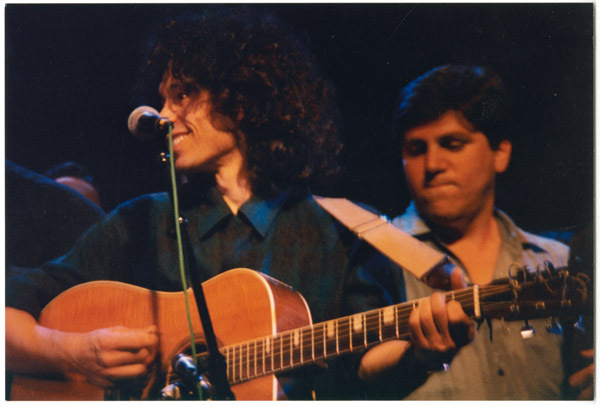 Richard was a key member of the Greenwich Village folk scene from 1982 until his illness made it impossible for him to continue to play. Meyer, who was born in 1952, had a background in theater production and set design. After spending four years in Los Angeles trying to make it as a songwriter, he returned to New York in 1982 and became involved with the Songwriters Exchange (members would endeavor to write a song a week) and a cooperatively run folk club (called, appropriately, “the CooP”) operated out of the SpeakEasy in New York’s Greenwich Village (the space was shared with a falafel stand and a belly dance venue). “There was always someone writing a song. For a $2 membership and some bathroom-cleaning/calendar-folding, you could see every show for free,” Meyer recalled in the liner notes for Fast Folk: A Community of Singers and Songwriters (SFW40135). Just a few months before Richard Meyer joined the ranks in 1982, the CooP started producing a monthly magazine-and-LP which sold for two dollars at shows at the SpeakEasy. Before the internet brought with it the endless possibilities for promotion and networking, new songwriters needed an avenue to get their music noticed, and putting out your own album was expensive. The CooP/Fast Folk model was bare-bones: recordings were usually done in one take, and if another take was needed, it was recorded over the last. Most of the work depended on volunteers. “Commercial potential did not enter into the equation…there is always an audience for a good song,” said Jack Hardy (SFW40135). Hard-working and industrious, Meyer fit right in to this ambitious effort. He began to take on more and more responsibilities, writing and designing for the magazine, managing the annual Fast Folk Revue, and eventually becoming its editor. In Fast Folk's early years, the covers were generic white sleeves. Founder Jack Hardy and the group wanted to start producing illustrated covers. Meyer, still new to the scene, volunteered that he had a background in graphic design and took over those duties for the magazine. He would also screen demos with Jack Hardy, wading through tapes upon tapes of artists hoping to be a part of the publication. They were looking for well-crafted songs: the artist and their image were secondary—the music had to stand up on its own. Sometimes what a songwriter would think was their best song was trumped by the vision of Meyer and Hardy, and the magazine was a reflection of their editorial eye. Meyer, an accomplished songwriter in his own right, was able to continue making his own music within this process, and many of his songs were issued. In addition to the magazine, Fast Folk sponsored shows of Fast Folk artists including their popular annual Revue at the Bottom Line in Greenwich Village, which Meyer produced and promoted. They also held shows in different cities and recorded the proceedings for special on-the-road issues. Meyer took over the editorship of the magazine in 1986. He oversaw the magazine’s “controversial” move to begin distributing the recording portion of Fast Folk on CD (it began as vinyl). Their subscribers voted against the move (there are many an impassioned letter in the Fast Folk collection predicting apocalyptic repercussions for changing formats, a subject we’ve written about in the past), but due to cost constraints, the rapidly changing industry, and the benefit of being able to fit more songs on the new format, the switch was made. He remained its editor until 1997, when, after 105 issues and recordings, the magazine could no longer sustain itself on dwindling volunteer labor. As the 1990s waned, changes in the industry and the growth of the DIY music business made an organization like Fast Folk less necessary. Richard Meyer and the board of Fast Folk were looking to what to do in the future with the materials and recordings they had made. There was still talk of continuing some of the shows, if not the magazine. In 1999, Richard Meyer facilitated the donation of Fast Folk’s recordings, business records, press clippings, magazines and photographs to the Center for Folklife and Cultural Heritage, creating the Fast Folk Musical Magazine records (for a more detailed description of the collection's contents, see the finding aid). Though the Folkways label, the Smithsonian already owned and represented many singer-songwriter and folk song revival singers of the 1960s and 1970s. The addition of Fast Folk would add key musicians from the later decades. Richard Meyer oversaw the digitization of all the recordings and fully cataloged each recording in a database. The label came to Washington and is now available the the public in perpetuity. In 2002, working with Jack Hardy and Jeff Place, Meyer produced a two CD set for Smithsonian Folkways called Fast Folk: A Community of Singers and Songwriters (you can listen to samples on the Folkways website). The CD was in keeping with the ongoing philosophy of Fast Folk not to solely focus on the “stars” who had come from their midst but to feature other lesser known writers that they thought should be better known. All 105 Fast Folk albums are available on CD and digital downloads through Smithsonian Folkways Recordings, a resulting legacy of Richard Meyer’s efforts. Richard was a highly dedicated worker, music advocate, and a great supporter of all his artistic friends. He will be missed.